The Breakfast Club, an iconic portrait of 1980s American high school life, is now available in an all-new digitally remastered Flashback Edition with never-before-seen bonus features! When Saturday detention started, they were simply the Jock, the Princess, the Brain, the Criminal and the Basket Case, but by that afternoon they had become closer than any of them could have imagined. 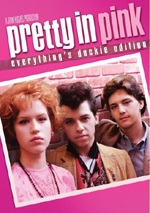 Featuring an all-star ’80s cast including Emilio Estevez, Anthony Michael Hall, Judd Nelson, Molly Ringwald and Ally Sheedy, this warm-hearted coming-of-age comedy from writer/director John Hughes helped define an entire generation! 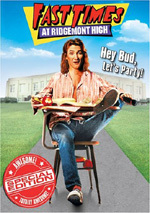 The Breakfast Club appears in an aspect ratio of approximately 1.85:1 on this single-sided, double-layered DVD; the image has been enhanced for 16X9 televisions. The movie featured a pretty lackluster transfer. A mix of source flaws interfered at times. I noticed a mix of light specks and marks. None of these seemed excessive, but they created distractions. Given the movie’s age, I thought this was good enough for a “C+”, but that was about it. Nothing special emerged from the audio of The Breakfast Club either. The DVD featured both Dolby Digital 5.1 and DTS 5.1 soundtracks. The pair seemed virtually identical – and redundant, since this wasn’t exactly a flick with a lot of sonic ambition. A chatty movie, the soundscape didn’t open up too much. Music disappointed, as the pop/rock songs and score remained essentially monaural. They boasted a little reverb in the side and rear speakers, but that was all; there was no real stereo imaging in terms of music. For this “Flashback Edition” of The Breakfast Club, we get an audio commentary with actors Anthony Michael Hall and Judd Nelson. Along with moderator/DVD producer Jason Hillhouse, the pair sit together for this running, screen-specific chat. 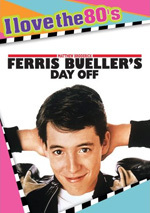 They discuss cast, rehearsals and performances, working with director John Hughes and the other filmmakers, sets and locations, and a few production stories. While The Breakfast Club lacks the relevance it boasted for me when it hit in 1985, it still has its moments. I could live without all the melodrama, but there’s enough good material here to make it interesting. The DVD provides generally average picture and audio as well as some decent extras. This isn’t a great release, but it’s acceptable and will probably be enjoyed by the flick’s fans. 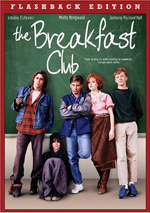 Note that you can buy The Breakfast Club either on its own or as part of a three-movie “High School Flashback Collection”. In addition to Club, this package includes Sixteen Candles and Weird Science. With a list price of $39.98, the set is a good deal for fans of the flicks; essentially, it acts as a “buy two, get one free” deal.